Gut microbiota is associated with the metabolic health status of an individual. The symbiosis between host and microbiome is initiated at birth, and early life microbiome perturbation can disturb health long-lastingly. Researchers from the Universities of Gothenburg, Copenhagen and Wageningen, and Nutricia Research investigated how beneficial microbiome interventions in early life affect metabolic health in adulthood. The researchers found that young mice supplemented with synbiotics (scGOS/lcFOS* with Bifidobacterium breve M-16V) for the first 6 weeks of life showed significantly reduced fat mass and body weight in adulthood compared with other study groups, when challenged with a subsequent 8-week high-fat Western diet. To test the robustness of the findings, the study was repeated in a different animal facility in another European country, and resulted in reproduction of the results. “Early life synbiotics also affected adult parameters related to glucose homeostasis and lipid metabolism, including improved systemic markers (i.e. plasma insulin and total cholesterol), as well as molecular factors (gene expression) related to cholesterol metabolism in the ileum. In addition, subtle changes in gut microbiota composition were observed both in early life and in adulthood, including increased Bifidobacterium abundance,” said the first author of the paper, Mona Mischke, senior scientist of nutritional programming from Nutricia Research. In order to determine whether the protection against adverse effect of the high-fat Western diet was mediated by altered microbiota, the researchers transferred microbiota from the synbiotic and control group mice after intervention into age-matched 6-week-old germ-free (GF) mice, and challenged subsequently again with high-fat Western diet. In this case, no protective effect was seen in the recipients of the synbiotics microbiota. 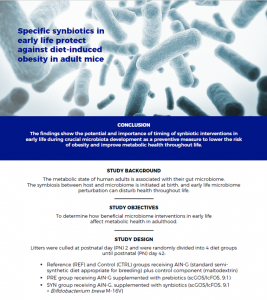 This implicates the importance of the timing of microbiota modulation; that is, exposure to synbiotics in early life is relevant for achieving long-lasting beneficial and protective metabolic effects. “Obesity in adults and children is on the rise globally. 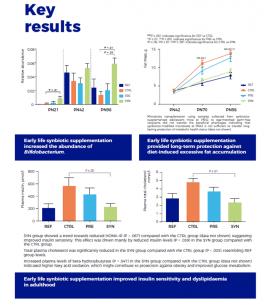 To this worldwide epidemic and its associated metabolic impairments, our study provides important insights on the beneficial effects of supplementation with synbiotics in early life, which may lead to the development of preventive strategies; however, validation in humans is warranted,” said Professor Jan Knol, Laboratory of Microbiology, Wageningen University. The study adds evidence that the early colonization of the digestive tract by symbiotic microbes may be critical for a healthy metabolic development and maintenance into adulthood. Download the study summary and key results.